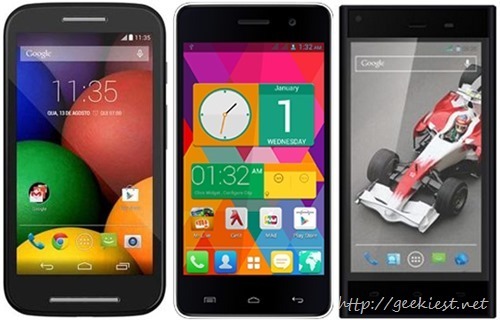 2014 has been a rather interesting year for budget smartPhones. With Moto G conquering the Indian market in sub Rs. 15,000 category, Motorola announced Moto E with some decent specs like 1GB RAM, Qualcomm Snapdragon 200 SoC, Adreno 302 and some never-before-seen-in-this-price specs like Gorilla Glass 3, qHD screen, and water resistant nano-coating on the screen. Moto E was launched in the Indian market for Rs. 6,999 and was sold exclusively by Flipkart. It’s popularity can be asserted by the fact that it was sold out in a matter of hours. Many ‘Moto E killers” were launched by the Indian manufacturers to quickly grab some market share, namely Micromax Unite 2 and Xolo Q600s. Despite having an IPS LCD display, Micromax Unite 2 has a 480 x 800 resolution which when compared to it’s 4.7 inch screen gives us a measly pixel density of 199 PPI. Moto E has a 540 x 960 “qHD” display which, paired up with it’s 4.3 inch screen gives us a much higher pixel density of 256 PPI. Xolo Q600s has the best of both worlds by having an IPS LCD screen and also having a qHD screen while being 4.5 inch and giving an effective pixel density 245 PPI. Micromax Unite 2 is powered by a Quad core Mediatek MT6582 processor which is clocked at 1.3 GHz. Xolo Q600s has a Broadcom BCM23550 which too is Quad core and is clocked at 1.2 GHz. Moto E has a Dual core Qualcomm Snapdragon 200 processor which is clocked at 1.2 GHz. Qualcomm CPUs have always been better than their competition and same applies here. Micromax Unite 2 has a Mali 400 GPU which is pretty outdated by current standards, Xolo Q600s has a Broadcom VideoCore IV GPU which is decent but still the pick of the lot has to be the Adreno 302 of Moto E which is sufficiently powerful to play casual games and some high end games at low settings. Moto E has a fixed-focus rear-camera of 5MP without LED Flash, front camera is absent too, whereas both Xolo Q600s and Micromax Unite 2 have a 5MP rear camera with LED flash and also have a 0.3MP and 2MP front cameras respectively. Moto E has been advertised as “made to last” and that’s true owing to it’s Gorilla Glass 3 making it resistant to scratches and its nano-coating making it resistant to water splashes. Nothing special to mention for the other 2 droids. All of them run Android 4.4.2. Moto E runs an almost stock (AOSP) version of KitKat and therefore is more responsive and less battery hogging than Micromax Unite 2 and Xolo Q600s, which run custom interfaces laden to them. As far as OS updates go, Moto E has an update guarantee by Motorola unlike Micromax Unite 2 and Xolo Q600s which may probably not receive further updates. Unless you’re fond of selfies, want a bigger display and can’t live without LED Flash, there ain’t no reason to not recommend Moto E. It offers the most value for money and is ideal for those who tinker with their device (rooting, installing custom ROMs, etc) due to the fact that Motorola is the most developer friendly of these 3 and also due to the fact Qualcomm>Broadcom>MediaTek. tl;dr - Go for the Moto E.
Moto G and Moto X may be recalled in Germany.